The Apple TV is the second version of the company’s set-top multimedia box for streaming content from your iTunes library and a few Internet sources to an attached TV. The first version contained a hard drive, which allowed you to store media on the device—either media synced from your iTunes library or content downloaded from the iTunes Store. 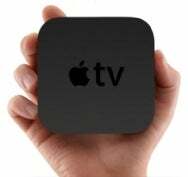 Today’s Apple TV is a smaller, more responsive device that can only stream content. It offers an HDMI video connection as well as an optical digital audio output. It can play video at resolutions up to 1280 by 720 pixels (720p) and will output Dolby Digital 5.1 surround-sound audio. It supports H.264 and MPEG-4 video; AAC, MP3, AIFF, WAV, and Apple Lossless audio; and JPEG, GIF, and TIFF still images. Like iPods, iOS devices, and authorized computers, it can play iTunes-protected content. Capable of 802.11n wireless networking, it also bears a 10/100BaseT ethernet port for wired networking. This Apple TV also supports Apple’s AirPlay media-streaming scheme, which lets you stream music or videos to the Apple TV from a compatible computer or iOS device. Setting up an Apple TV is a snap. If you have a wireless network in your home, the Apple TV will attempt to identify it. Select your wireless network from the list of available networks and, if necessary, enter the network password. If you use a wired network connection, the Apple TV will join the network via DHCP. To play content from an iTunes library, launch iTunes, choose Advanced -> Turn On Home Sharing, and enter your Apple ID and password (repeat as needed for other iTunes libraries on your local network). On the Apple TV, choose Settings -> Computers and select Turn On Home Sharing. Again, you’ll be prompted for your Apple ID and password. Connected Macs will appear under the Computers heading on the Apple TV’s main screen. To enable photo streaming to the Apple TV , select Advanced -> Choose Photos To Share. In the resulting Photo Sharing Preferences window, enable the Share Photos From option; select your iPhoto or Aperture library, a folder of your choosing, or the Pictures folder; and enable the Include Videos option if you want to also stream videos. Click the Apply button at the bottom of the window. If you’d like to stream music and video to your Apple TV via AirPlay, move to the AirPlay command under the Settings menu on the Apple TV and switch on the AirPlay option. If you like, you can also create an AirPlay password in this screen. On an iOS device, just launch an AirPlay-compatible app, tap the AirPlay icon (which looks like a rectangle with a triangle pointing up into it), and choose your Apple TV as the destination. On Macs or PCs running iTunes 10, you’ll see an AirPlay icon if there’s an AirPlay-compatible device on the local network. Click it to choose when to send your output. The music or video will then stream to the Apple TV. The Apple TV includes Apple’s latest $19 Apple Remote. With it you can easily move through the Apple TV’s menus and pause and play videos, audio, and slideshows. You can also control the Apple TV via Apple’s free Remote app ( ), which works with the iPhone, iPod touch, and iPad. The Remote app is even easier to use. Not only does it present your media in a tappable form, but you can use its search field and keyboard to locate exactly the media you want to play. Although the Apple TV has its own on-screen search field, you must input characters one by one, by clicking the virtual keyboard and using the remote, which can be slow going. Regrettably you can use the Remote app only with media in an iTunes library—not with Internet-based content. As mentioned, the Apple TV lets you stream the contents of your iTunes library, but it also reaches out to the outside world. As with the Apple TV of the past, today’s Apple TV allows you to access YouTube videos, Internet radio stations, podcasts, and pictures and videos from MobileMe Galleries and Flickr accounts (your own and those of your contacts). The second-generation Apple TV both expands and contracts the original’s capabilities. If you have a Netflix account, you can use your Apple TV to stream Netflix content to the device. Netflix allows you to link your account to as many as six devices. And the 4.2 software update for the Apple TV lets you access MLB.TV and NBA League Pass sports subscriptions as well. What you lose with the new Apple TV is purchasing power. With the first Apple TV you could purchase music and videos from the iTunes Store directly from the device. This is no longer possible, because the Apple TV—which lacks a hard drive—has nowhere to store this content. Instead you can only rent movies and TV shows, which are streamed to the device over the Internet. If you want to purchase iTunes Store content, you must do so with your computer or iOS device, and then stream it to the Apple TV. TV show rentals cost $1 per episode, and most recent TV shows are offered in HD at no additional cost. You can rent recently released movies in HD for $5, whereas older HD titles cost $4 to rent. Older titles in standard-definition format cost $3 to rent. As with TV shows, you have 30 days to start watching rented movies, but you have only 24 hours from the time you start watching a movie to complete it (versus 48 hours for TV shows). Best For The Apple TV is a good match for people with HDMI-equipped audio/video systems who want to enjoy their iTunes content, people who otherwise lack a Netflix device, individuals who want to rent movies and TV shows from the iTunes Store, and iOS device owners who want to stream music and videos from their late-model iPhone, iPod touch, or iPad. Not Ideal For If you want a set-top box that lets you access a lot of Internet media (Hulu and Pandora, say), or you’re a video purist who demands 1080p content, you’ll be disappointed with the Apple TV.